There’s been a lot of discussion on “mite bombs” and the drifting of bees and mites from hive to hive. But there’s been surprisingly little research to measure exactly how many mites actually do manage to successfully catch rides into other hives. I’d like to offer an opportunity for beekeepers to answer that question ourselves. I’ve recently wrapped up a large and very interesting field trial on bee and mite drift, and will soon be publishing the results. But before I do, I need to ask for volunteers to join me in an across-country project to obtain hard numbers as to the amount of late-season varroa immigration that occurs in various areas across the country. This data set would be best if it included counts taken in hobby, as well as commercial apiaries, and from regions with low as well as high hive density. If you’re interested in participating, read on. Most of us have observed sudden spikes in the mite levels of our hives late in the season. Many suspect that an influx of mites restocked the varroa population in the hive after treatment. And my monthly mite washes taken for our selective breeding program strongly suggest that substantial mite immigration can take place in September and October ― I’ve previously written about this subject []. We can guess and computer model all we want, but what we really need is hard data. There have been few published studies on this, which I summarized in the graph below (Fig. 1). Figure 1. 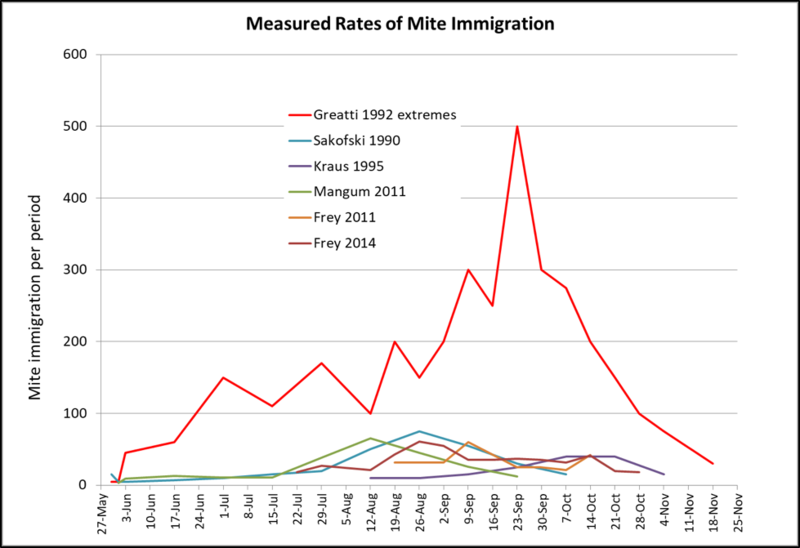 Greatti’s [] figures indicate that it’s possible for thousands of mites to immigrate into a hive late in the season. This mite drift can then prime a treated and otherwise healthy colony for winter collapse. I was curious as to just how many mites were coming into my hives last summer (and where they were coming from)—could it indeed be thousands? So last summer I set a dozen hives up to track mite immigration. Results: It varied greatly from hive to hive. The semi-weekly immigration into the hive that received the most mites in shown below (Fig. 2). Although we counted over 500 mites entering the hive above, based upon my tracking of mite infestation rates in my breeding program, I strongly suspect that the amount of mite drift had been, for some reason, several times higher the previous year. Practical application: It’s clear that mite immigration in late summer and fall can be substantial. A flood of incoming, reproductively-active mites coming into a hive, just as it’s downsizing for winter, could cause real problems. Imagine that I had treated the colony above after I pulled the honey in early August, and then 500 mites moved in in September and October ― and reproduced just once. That could result in there being enough mites to take an 8-frame cluster into the winter with a varroa infestation rate of over 6 mites per hundred bees ― high enough to lead to over-winter DWV collapse. Another thing I found was that mite immigration varied greatly from hive to hive. 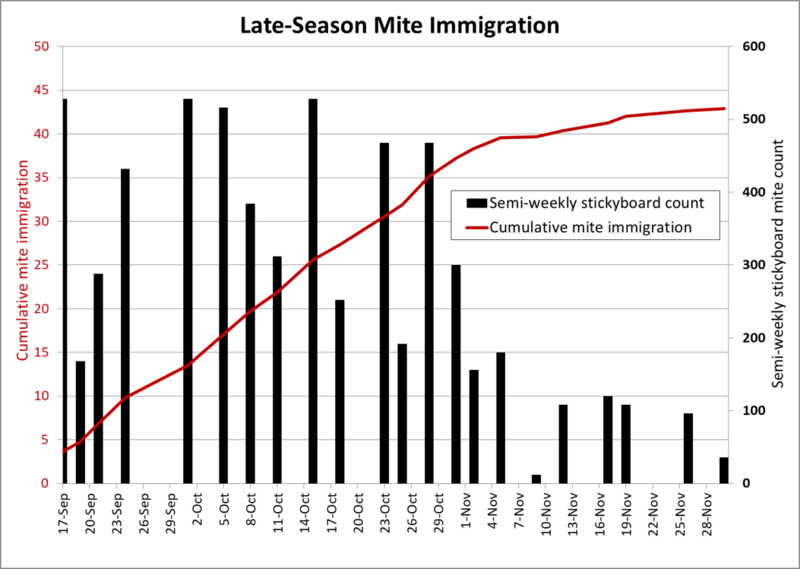 Even in the same yard, the cumulative mite immigration counts varied tenfold. Practical application: some hives in the same yard pick up far more mites than others. Why this is I don’t know, but it has huge implications for mite management, and possible directions for selective breeding programs. You’ll need to follow the protocol below exactly, so that we can compile and compare the data. Your monitor hives will need to have varroa completely eliminated well in advance, so best to start by mid-May ― you can’t procrastinate. Once you get the mites down, each monitor hive (more than one would be best) will need a screened bottom and two stickyboards to swap out. You’ll need to perform stickyboard counts twice a week, or arrange for someone to cover for you. Luckily, you won’t likely need to count too many mites each time — for the hive above, the highest semi-weekly count was only 44 mites. Before you start, email me for a copy of this protocol, data sheets, and miticide strips (if necessary). At least six weeks in advance (I suggest mid-May), choose one, or preferentially more, strong, healthy hives to monitor. In order to avoid inadvertently selecting colonies that may exhibit some sort of resistance to invasion, it may be best to start with colonies that exhibit “normal” mite counts. Eliminate the mites: It may help to first apply an oxalic or formic treatment for quick knock down, then simultaneously apply two different time-release synthetic miticides (e.g., Apistan®, Checkmite II®, or Apivar®) at the full label rate for the size of the colony (Fig. 3). I had very good results by applying both Apistan and Apivar strips at the rate of one strip of each for every five frames of bees []. If you don’t want to purchase full packages of the strips, I’ll be happy to provide the total number of strips needed, free of charge. Figure 3. I used one strip each of Apivar and Apistan for every 5 frames of bees in the cluster. Since you’ll be leaving the strips in the hive for the duration of the experiment, you cannot harvest any honey from these hives ― instead use if for winter feed. Monitor the mite drop with stickyboards (Figs. 4-6) until it drops to zero per day (and you feel confident that there are no mites left in the hive). This should occur by the first of July — the most reasonable time to start your counts. Figure 4. Each monitor hive must be set up with a screened bottom of 1/8” hardware cloth, over a holder for a stickyboard. Several designs are available on the market, or you can make your own (I’ll supply plans). 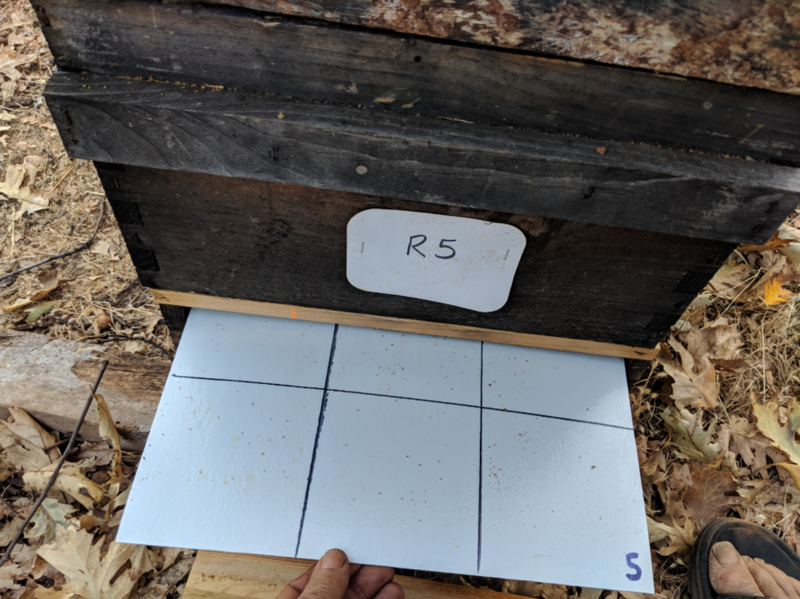 On this stickyboard I’ve drawn a grid in order to make accurate mite counting easier, and labeled the stickyboard with the hive number. I prefer accessing the stickyboard from the rear of the hive. Figure 5. I’ve tried a number of types of stickyboards. The best I’ve found are those I made myself by using a table saw to cut a sheet of white “FRP wallboard” into appropriately-sized pieces []. We then use a mini paint roller to apply a mixture of mineral oil and petroleum jelly [] ― which prevents any live mites from crawling away, or ants from carrying them off. From this point on, keep a stickyboard in the hive continuously, rotating them to take regular mite counts twice a week (to avoid accumulation of hive trash on the stickyboards). Do not feed the hives any pollen sub during this time, as it will make counting the mites difficult. 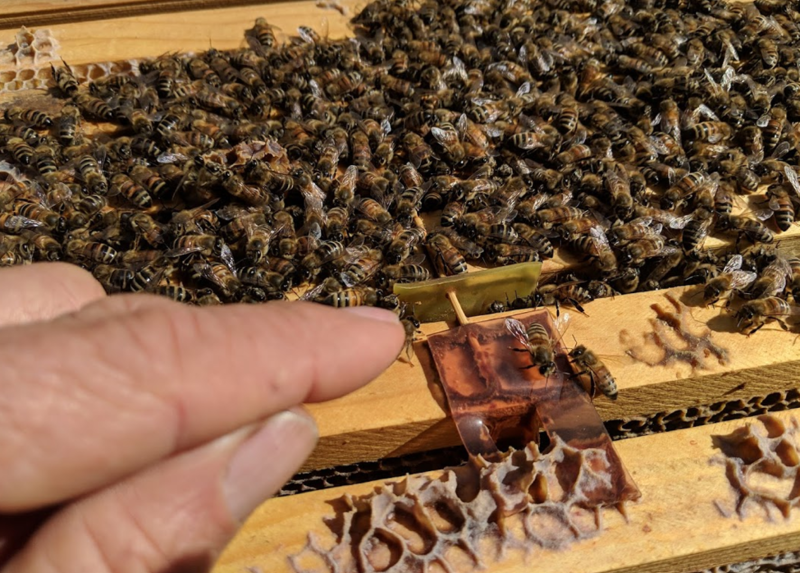 Since there were no mites left in the hive, any mites on the stickyboards must have been carried in from outside, and then quickly killed by the miticides. Record this data by date and mite count. Continue these counts until colonies go dormant from the cold (winter data would be of interest from where bees fly all year). Figure 6. 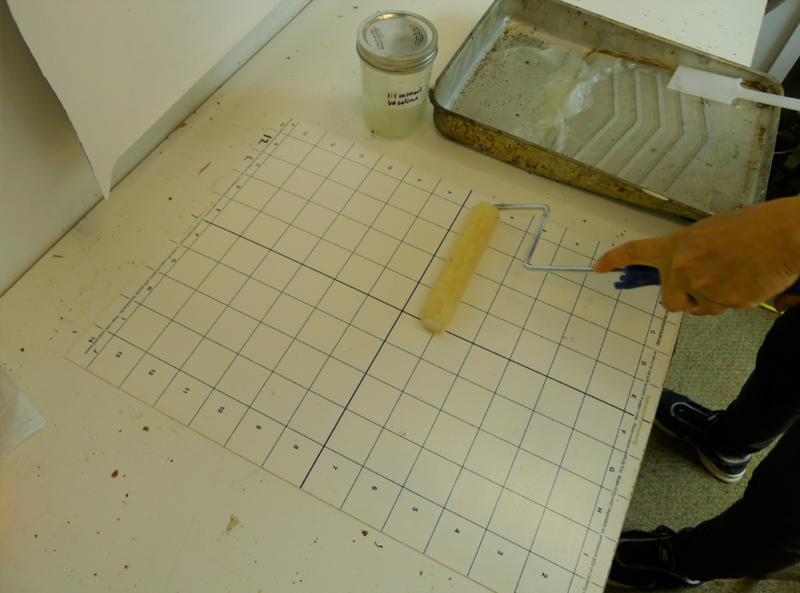 In this photo I show a non-FRP stickyboard with a tighter grid, which I use for experiments in which I expect to have to count larger numbers of mites. Plastic stickyboards can be easily scraped clean with a windshield scraper or drywall knife, then rerolled with a petroleum jelly mixture. The easiest confirmation is that mite counts will drop back to zero once mite drift ceases and cold weather prevents bee flight. Refer back to Figure 2 ― if mites had been reproducing in the colony, the drop counts would have gone up as the colony cut back on broodrearing in November. During the monitoring period, alcohol washes should be zero (there may occasionally be one newly-immigrated mite that hasn’t yet been killed). Check the drop rate on rainy days when there is no bee flight (it should be zero by the second day of rain). Use a dissecting ‘scope or penlight and magnifying glass to confirm that no mites are in the brood (Fig. 7). Figure 7. 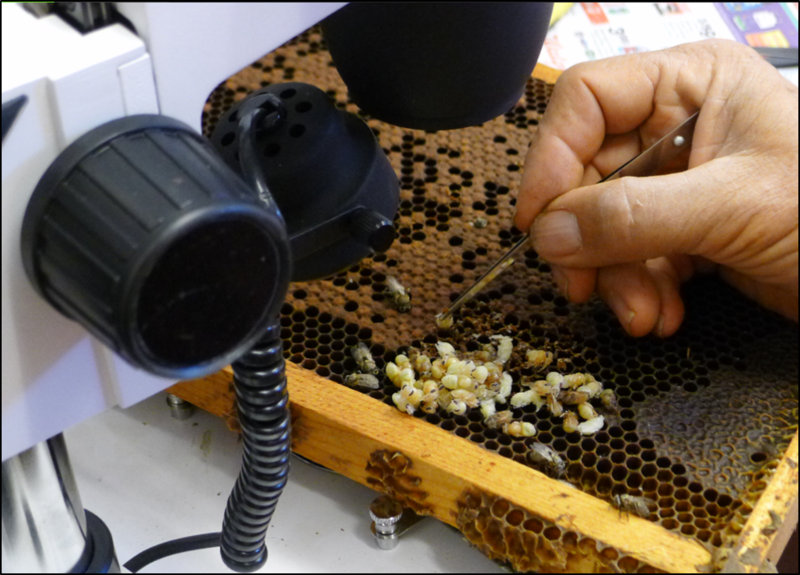 Here I’m using a dissecting ‘scope to confirm that there are no mites reproducing in the brood of a monitor hive, by using forceps to pull out 100 dark-eyed pupae, and then peering into the cell to see whether there are any signs of a mite. This last method is a bit tedious, and generally not necessary. The common complaint that “varroa must have flooded into my hive late in the season” needs to be confirmed and quantified, so that we can develop better Best Management Practices for varroa control, so that I can enter that information into my free mite model [], and so we can account for this problem when breeding for mite-resistant stock []. We beekeepers can collaborate in order to determine the amount of mite drift that actually occurs in neighborhoods, country, and agricultural areas all over the country, and for hobbyists as well as commercial operations. Greatti,M, et al (1992) Reinfestation of an acaricide-treated apiary by Varroa jacobsoni Oud. Experimental & Applied Acarology 16: 279-286. The sources of the other data are in The Varroa Problem part 16b. The mites in my operation had no history of exposure to either of those miticides, so I expected high efficacy. No retreatment was required — I just left the strips in ‘til the end of the monitoring. You must confirm via alcohol wash or brood dissection that no mites are reproducing in your monitor hives. FRP wallboard are 4-ft x 8-ft “fiberglass-reinforced plastic” sheets, readily available at home building supply stores, and used for waterproof wall paneling. The sheets are very strong, don’t warp, and can be reused over and over. 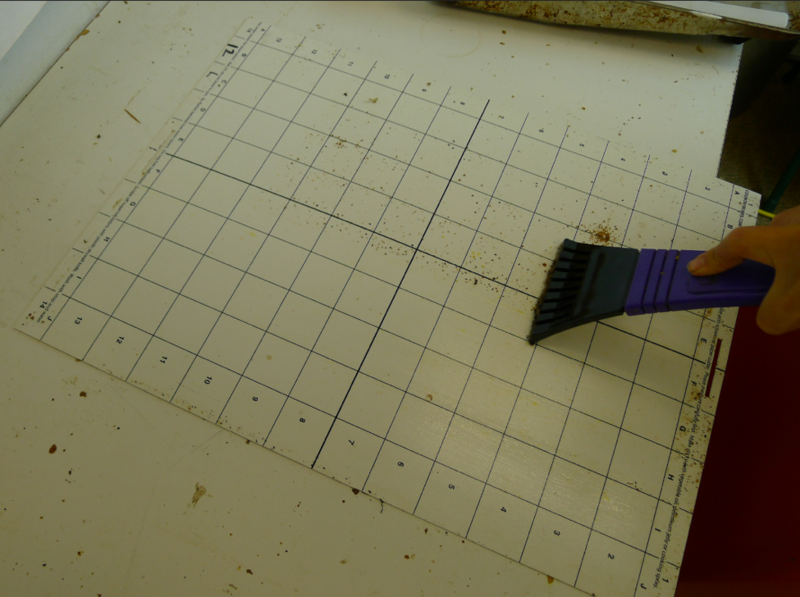 I cut them on a tabIe saw, then draw a grid on them before the first application of the petroleum jelly mixture with a black Marks-a-Lot® brand felt pen, which I find holds up very well. The stickyboard in this photo, however, was not made of FRP. What works well for us is to scoop a 13-oz container of petroleum jelly (Vaseline®) into a saucepan, add a 1-pint bottle of mineral oil, and stir it over gentle heat until the jelly is dissolved. Then pour the mixture into wide-mouth shallow jars to cool. This mite immigration was evident in the USDA program for breeding the Primorsky Russian bees, and appears to have been a problem in my own program. Such late-season immigration can overwhelm what might otherwise have been colonies that could manage varroa on their own, if not subject to an influx of mites from outside.